The twelfth contest between fellow Spaniards Rafael Nadal and Nicolas Almagro went the way many of the others have gone. 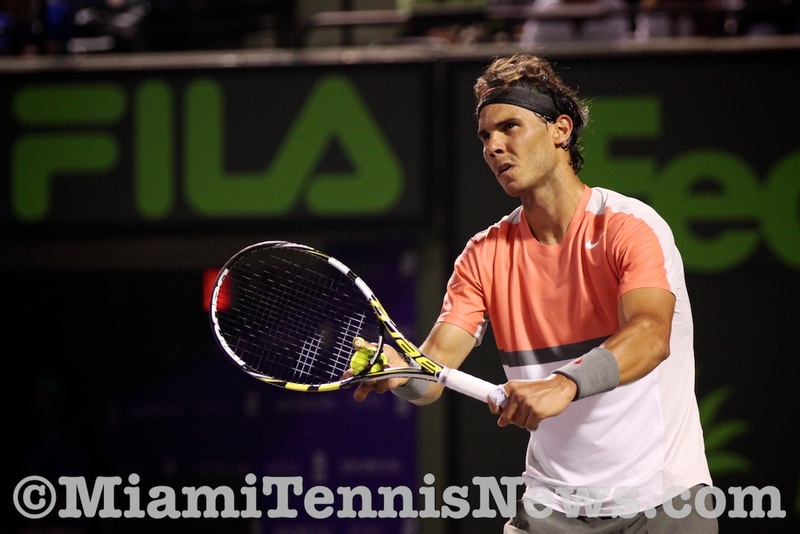 Nadal posted a 6-4, 6-2 victory to advance to the third round at the Miami Open. Almagro came in with a ray of hope after banking his maiden victory over the world number 3 last year in Barcelona. Today was the competitors’ third meeting on hardcourt and Almagro’s triumph materialized on clay a surface he excels at. Moreover, the latter’s 2014 season was marred by a foot injury requiring surgery. Almagro began 2015 on the right foot with a successful South American swing which culminated with a semifinal appearance in Buenos Aires. Nadal hasn’t been sizzling on any surface of late. His 46th clay court prize in Buenos Aires a few weeks ago was his first since the 2014 French Open. The world number three’s best on hardcourt in 2015 has been quarterfinals at Indian Wells and Australian Open. Consequently, Almagro came in with a ray of hope. With a flubbed forehand volley by Almagro, Nadal converted on break point in the initial set for 2-1. The 14 time major winner stared down three break points on his serve before securing the set. In the second set, Almagro dumped a forehand into the net on double break point to place his opponent in the lead at 2-1. Shortly thereafter, Nadal bolstered his edge with a love hold. Later on, with a forehand winner, Nadal cushioned his position with an additional break for 4-1. At that stage, it was clear that Almagro would have to wait another day for the hope of a second victory over his compatriot. In analyzing his performance, Nadal believes “I played a solid match. . .I had to put the balls in and play with no mistakes today with very tough conditions. . .my forehand worked well. . .I’m happy, Almagro was not an easy opponent for the first round”. Commenting on the deluge which followed a few minutes after he was done, “sure important to finish the match before the storm arrived. . .But that can happen here in Miami. It’s nothing new”. Four times the groomsman, never the groom, the Miami Open has been less kind to Nadal than Indian Wells, he possesses three of those trophies “it is true that Indian Wells has been a tournament that has worked better historically for my game. . .the bounces are higher. . .I like playing in [Miami]. . .some days can be very humid and hard for the body. But in general, they are the conditions I like to play tennis. . .Sea level, hot, no problem, I like to play tennis”. Earlier in the day, two time Miami Open champion Andy Murray disposed of Donald Young in two sets 6-4, 6-2. Murray improves his record against the American to 5-1. After surrendering the opening set in a tiebreaker, world number eight, Stanislas Wawrinka knocked out Carlos Berlocq. 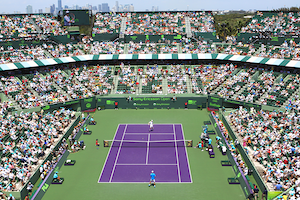 The inaugural semifinal at the Miami Tennis Cup featured Andy Roddick, who bowed out of the game this year, against reigning U.S. Open champion Andy Murray. Roddick, 2003 U.S. Open winner, prevailed 6-3, 6-2 over Murray to book his spot in tomorrow’s final. Murray has had the upper hand in this rivalry with an 8-3 record. Consequently, Roddick was hungry for a victory although this is an exhibition tournament. After converting on an early break point, Roddick built a 4-1 cushion. Down the road, on his third break point opportunity, courtesy of a Murray backhand crosscourt miscue, Roddick bagged the set 6-2 when Murray committed a second consecutive backhand crosscourt mistake. The last encounter that Roger Federer had with Juan Monaco was three years ago at the Masters Series in Hamburg whereby he was victorious. Although the Argentine is known to excel on clay, he gave Federer a good fight on hardcourt today. Federer pulled away with a 7-6, 6-4 win to pen his name into the fourth round. As a result of a double fault, Federer gave Monaco break point in the opening game. However, Federer managed to hold. By misfiring on a forehand, Monaco gifted Federer a break point and threw in a double fault for the break. At this point, it seemed Federer would make short work of world number 35. But with a couple of mistakes of his own, Federer surrendered the next game allowing Monaco to get back on serve. At 2-1, Federer had a couple more chances to break. Still, Monaco was unflappable and guarded serve. With Monaco saving six out of seven break points, the first set went to a tiebreaker which Federer claimed. In the second set, Monaco dominated on serve while Federer had a few tight games. Consequently, it seemed that the match could go to a third set. As usual though, Federer stepped it up at the right time. After an ace for game point, Monaco double faulted for deuce. Then, with a forehand winner, Federer had his second break point opportunity of the game. When Monaco’s forehand landed long, Federer went up 5-4. With Federer serving for the match, Monaco continued to resist. Finally, with a forehand up the line winner, Federer arrived at 40-30. With Monaco’s stroke going out of play, Federer penned his name into the next round. The first week of play has come to a conclusion at the French Open. While Andy Murray, the fourth seed, going out in the fourth round to Tomas Berdych was a shock. The biggest eye popper was David Ferrer, the ninth seed, a definite threat to Rafael Nadal in the bottom half, being ousted in the third round in three sets by Jurgen Melzer. With both Roger Federer and Nadal methodically working through their sections, the possibility of a final between these two is very much alive. Despite stumbling at times, Federer, the defending champion, has pulled through all four matches in straight sets. Robyn Soderling, the 2009 finalist, has played steady ball. Soderling had no difficulty with Albert Montanes in the third round nor Marin Cilic in the fourth round. Now, Soderling faces Federer in the quarterfinals and will get the opportunity to seek revenge for last year’s defeat. Although Federer has an ATP 12-0 record against him, Soderling prevailed in an exhibition in Abu Dhabi this January. Therefore, Soderling will not be intimidated. The French will have to wait for their homegrown champion yet another year. In the first round, Richard Gasquet went down to Murray in a thrilling five setter. Then, in the second round, Gael Monfils was sent packing in a marathon two day drama. Lastly, in the fourth round, Jo-Wilfried Tsonga was compelled to retire against Mikhail Youzhny due to a back injury. Youzhny battles Berdych as the other quarterfinalist in the top half of the draw. In the bottom half, after outlasting Mardy Fish in a five set brawl, Ivan Ljubicic could not withstand another assault from 22 year old Thomaz Bellucci. Yet, in reaching the fourth round for the first time at a major, Bellucci’s prize is Nadal. At the start of the tournament, Americans with authentic possibilities were likely Andy Roddick, John Isner and Sam Querrey. The greatest hope was for Isner and Querrey, the latter had prevailed over the former in the finals in Serbia. With no prior clay court competition, for Roddick, it was going to be an uphill battle to make it deep into the draw. 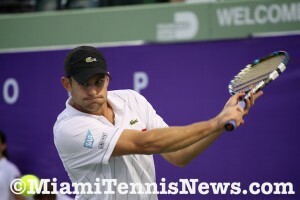 In the third round, Roddick was outplayed by qualifier Teimuraz Gabashvili and went out in straight sets. Similarly, in the third round, Berdych expedited Isner. Still, there is a Stars and Stripes bearer into the second week, he is Bobby Ginepri ranked 98th. After beating Querrey in the first round, Ginepri outfoxed former champion Juan Carlos Ferrero in the third round. In the fourth round, Ginepri battles Novak Djokovic. Djokovic has not been performing at his peak, needing four sets in the first round against Evgeny Korolev, had a tough second round match versus Kei Nishikori and another four setter against Victor Hanescu. If that pattern continues, Ginepri has a good shot at an upset.